Nightshade vegetables are fun, nutritious vegetables that include potatoes, tomatoes, and chili peppers (see the list below). Potatoes and tomatoes are two of the most popular vegetables in the United States. These are very healthy vegetables that, however, are definitely not for everybody. In some people, these vegetables can cause chronic joint, muscle, and nerve pain. This is believed to be due to the alkaloid chemicals that these vegetables and their relatives, such as tobacco, contain. In addition, nightshades are often served in unhealthy ways that can be significantly addictive. During World War I, when the blockade of Denmark prevented the importation of food, the people of Denmark survived largely on potatoes as well as whole grain bread and porridge, cabbage, and milk. The death rate in Denmark actually fell during this time, as Mikkel Hindhede of the Laboratory for Nutrition Research in Denmark reported in the Journal of the American Medical Association in 1920. Hindhede noted that based on previous experiments, an exclusive diet of potatoes with fat will sustain good health for at least a year. Additionally, both potato broth and raw potato juice have been used for healing purposes. Tomatoes are a staple of the healthy Mediterranean diet, along with olive oil, and other whole grain and vegetable foods. 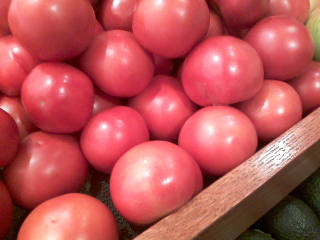 Tomatoes are the best and most common source of lycopene, the pigment that makes tomatoes red. Lycopene is a carotenoid, a cousin of beta-carotene. It's a unique antioxidant that, especially in food form, fights cancer and heart disease. It even survives heat and thus concentrates in cooked tomatoes. 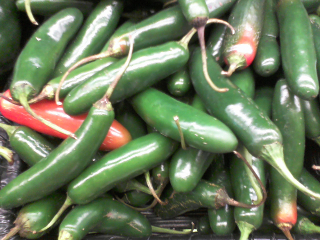 Chile peppers are rich in Vitamin C and carotenoids. Besides being fun for their sharp taste and stinging sensation, they will clear your sinuses and are particularly good for colds. That stinging sensation is the result of capsaicin, one of the nightshade alkaloids. Nightshade family plants manufacture drug-like chemicals within their tissues. These chemicals are of a type known as alkaloids. Nicotine is the most well known of the nightshade alkaloids. It's produced by the tobacco plant, which is a nightshade plant. A number of drugs and pesticides are derived from nightshade alkaloids. Drugs include belladonna, atropine, and scopolamine; some pesticides are based on nicotine. 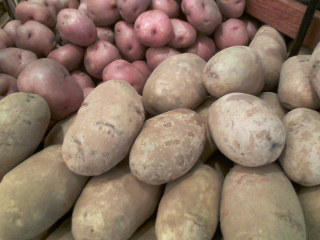 Green potatoes are toxic due to the alkaloid solanine. When potatoes are exposed to light, the potatoes' increased production of solanine causes the green tint. Do not eat green potatoes! They are toxic enough to cause poisoning. Potato sprouts also contain enough solanine to be toxic. Cut out the sprout and its eye before use. Due to these alkaloids, the leaves and stalks of these plants are poisonous. The ripe fruits and tubers also contain the alkaloids, but in much smaller amounts. Capsaicin is what is so hot about hot peppers; it has both medicinal use and potential subclinical toxicity. In some people, the nightshade vegetables appear to cause arthritic pain, arthritic deformity, nerve pain, and other central nervous system problems. When Norman Childers of Rutgers University reviewed the veterinary literature about livestock that grazed on nightshade plants, he connected the reported illness, crippling, and death to arthritis and other manifestations of chronic pain in humans. The alkaloids found in common nightshade vegetables are powerful, with effects on various tissues, including the membranes of the cells of the body. They bioaccumulate: they remain unprocessed by the body and simply accumulate in tissues. In addition, nightshade alkaloids are cholinesterase inhibitors, just as organophosphate pesticides are. They affect the central nervous system and cause, among other adverse effects, pain. For sufferers of chronic musculoskeletal pain of any cause, Dr. Sherry Rogers, MD recommends eliminating the nightshade family for a three-month trial. (More on how to do a no nightshades diet.) According to Dr. Rogers and Dr. Childers, most people with chronic pain get major or complete relief from nightshade avoidance. Chile pepper or paprika is in cola drinks (hence "Dr. Pepper" as well as the more famous brands), snacks, breadings, meat flavoring, and more. Frequently these spices are listed on the label only as "Spices," "Flavors," or "Natural Flavorings." Potato starch, often in processed foods, may be listed only as "starch" or "protein" on labels. Potato starch is a frequent filler in medications and vitamin supplements. The nightshade alkaloids appear to be addictive, which is amplified by the vegetables' abuse in unhealthy foods. "Foodstuffs containing glycoalkaloids substantially alter the response to anesthesia because of inhibition of butyrylcholinesterase and acetylcholinesterase, which break down anesthetic agents and acetylcholine, respectively, and are important for normal nerve and muscle function." Pain Free in Six Weeks (Prestige Publishing, 2001) by Dr. Sherry Rogers, MD.